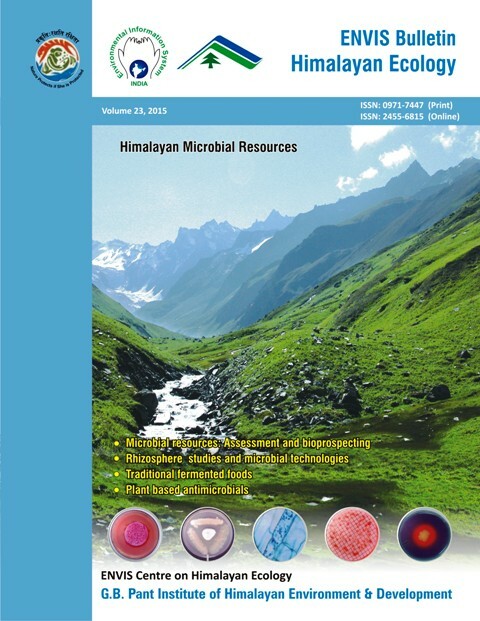 ENVIS Bulletin Himalayan Ecology is an annual open access publication (print and electronic) of the ENVIS Centre on Himalayan Ecology with financial support from the Ministry of Environment, Forest & Climate Change (MoEF & CC, Government of India). The content of the Bulletin may be quoted or reproduced for non-commercial use provided the source is duly acknowledged. The contributions to the Bulletin are welcome. The papers in this publication are the views of the concerned authors. Therefore, they do not necessarily reflect the views of the editors, ENVIS Centre and the Institute. Request for institutional subscription of the Bulletin may be sent to the Scientist-in-Charge of the ENVIS Centre. The comments/suggestions for further improvement of the Bulletin are also welcome.